Only masses of people developing their own mobilization potential can realize change through collective action. This is the abc of revolutionary politics. But this abc, today, faces profound skepticism from numerous leftist milieus in the west. We are told that we are taking our desires for realities, that there may have been a revolutionary impulse in Syria two and a half years ago, but that things have changed since then. We are told that jihadism has taken over the fight against the regime, that it is no longer a revolution but a war, and that there is a need to choose a camp to find a concrete solution. So much debate on the left is trapped in this ‘campist’ logic, often accompanied by conspiracy theories that blur the fundamental differences between left and right – especially the far-right. From the outset of the revolution, the main forms of organization have been the popular committees at village, city and regional levels. The popular committees were the true spearheads of the movement that mobilized people for protest. Then, the regions liberated from the regime developed forms of self-gestation based on mass organization. Elected popular councils emerged to manage those liberated regions, proving that it was the regime that provoked anarchy, and not the people. In some regions liberated from the regime’s armed forces, civil administrations were also set up to make up for the absence of the state in taking charge of its basic duties in various fields, like schools, hospitals, roads, water systems, electricity, communications. Those civil administrations were implemented through elections and (or by) popular consensus and have to provide civil services, security and civil peace among their main tasks. Free local elections in the ‘liberated zones’ occurred for the first time in 40 years in certain regions, neighbourhoods and villages. This was the case for instance in the city of Deir Ezzor, in late February 2013. Those local councils reflected the sense of responsibility and the capacity of citizens to take on initiatives to manage their own affairs relying on their managerial staff, their own experience and clean energy. Such initiatives took various forms, both in regions still under regime control and those that have freed themselves from it. This does not mean that there are no limits to those popular councils, such as the lack of representation of women, or of certain minorities. One is not trying to embellish reality, but to establish the truth. Another equally important element in the popular dynamic of the revolution was the proliferation of independent newspapers produced by people’s organizations. The number of newspapers went from three before the revolution –all in the hands of the regime – to more than sixty written by thèse civic groups. In the city of Deir Ezzor, in June, a campaign was launched by local activists to encourage citizens to take part to the process of monitoring and documentation of the practices of people’s local councils. Among other things, the campaign encouraged the promotion of rights and the culture of human rights in society. There was a particular emphasis on the idea of rights and justice for all. It is also important to remind everyone of the meeting in Rihania, a city on the Syrian-Turkish border, where the Free Syrian Union was formed on October 13, 2013, gathering about 106 military, media, and civil formationsunder its umbrella. These were all calling for a Free and Democratic Syria in which all sects and ethnicities would be treated equally. Although limited in some regards (e.g. the name Syrian Arab Republic was maintained as well as a call to return to the ‘liberal’ Constitution of 1950). But this initiative must clearly be included in any account of the democratic stakeholders in the revolution. A prominent example of self-management by the masses took place in the city of Raqqa, the only provincial capital that has been liberated from the regime (since March 2013), but is today occupied by Islamic State of Iraq and Syria (ISIS). In the first few months following the liberation of the city and despite still enduring regular regime shelling, Raqqa was completely autonomous and it is the local population that managed all the local services for the collectivity. These popular organizations, often led by young people, came on in leaps and bounds. They multiplied, to the extent that more than 42 social movements were officially registered by the end of May 2013. The people’s committees organized various campaigns. The “revolutionary flag represents me” campaign consisted in painting the revolutionary flag in neighbourhoods and streets of the city, to oppose the Islamist attempt to impose the black Islamist flag throughout. On the cultural front, a play mocking the Assad regime was performed in the city centre and at the beginning of June, these organizations held an exhibition for art and local crafts. Centres were established to give the youth an occupation and to treat the psychological disorders resulting from the war. By the end of the year, Syrian baccalaureate exams in June and July were entirely organized by volunteers. These types of experiences of self-management are found in many liberated regions. It is worth noting that women play a great role in these movements and in the protests in general. During summer 2013, solidarity gatherings called for the libération of kidnapped activists held in islamist-held prisons. The protests enabled the liberation of some activists, but numerous others remain in jail to this day, like the famous Father Paolo, and others including Firas, the son of the intellectual Yassin Hajj Saleh. In the people’s organised resistance to the islamist groups in the city of Raqqa, like elsewhere, women have played a leading role. Suad Nofal, a school teacher, for example, has been protesting nearly daily for months against the autoritarian practices of ISIS, demanding the release of political prisoners. Similar protests contesting the authoritarian and reactionary practices of the islamists took place in Aleppo, in Mayadin, al-Qusayr and other cities like Kafranbel. In the neighbourhood of Bustan Qasr, in Aleppo, the local population has protested numerous times to denounce the actions of the Sharia Council of Aleppo, which contains many Islamist groups. On August 23, 2013, for instance, the protesters of Bustan Qasr, while condemning the massacre through chemical weapons committed by the regime against people in Eastern Ghouta, were also calling for the liberation of the famous activist Abu Maryam, once more jailed by the Sharia Council of Aleppo. They continue until today to demand his release. At the end of June 2013, in the same neighbourhood, the activists shouted, “go f*c* yourself Islamic council,” protesting at the repressive and authoritarian politics of the latter. Popular outrage was also expressed following the assassination by foreign jihadists belonging to the Islamic State of Iraq and Syria group (ISIS) of a 14-year old boy, who allegedly made a blasphemous comment in a joke referring to Prophet Mohammad. A protest was organized by the popular committee of Bustan Qasr against the Islamic council and the Islamist groups. Activists cried, “what a shame, what a shame, the revolutionaries have become shabiha,” comparing the Islamic council to the Syrian regime’s secret police, a clear allusion to their authoritarian practices. There are weekly protests on Fridays. During the one on Friday 2 August 2013, the Local Coordinating Committees (LCCs), who play an important informative role for the revolution, but also a role of support by supplying foods, good and services to the populations and the refugees, declared this in a release: “in a unified message from the revolution to the entire world, we are confirming that the kidnapping of activists and essential actors of the revolution, unless they serve tyranny, hinder the freedom and the dignity of the revolution.” This message was addressed directly to those reactionary islamist groups. In the same vein, on 28 July 2013, the LCCs wrote a release with the title “the tyranny is one, whether in the name of religion or of secularism,” rejecting both the islamists and the regime. The Council of Salah Eldeen Quarter, in Aleppo, signed a placard on September 27 2013, saying in opposition to ISIS: “Take Your Islam and Leave Us Our Islam – Islam conquered hearts before lands”. In earlier September, eleven civilian groups representing the organized structures of the revolution in a broad area outside Damascus, rallied strongly around Razan Zaitouneh, a key grassroots revolutionary figure. The 36-year-old lawyer was threatened and harassed by members of armed jihadist factions in eastern Ghouta of Damascus, for no other reason than, “being an independent and unveiled woman who is among the grassroots leadership cadres of our revolution,” as one activist put it. More recent examples can be also be cited, such as the Statement of the Civilian Movement in Syria Regarding the Remarks of Mr. Zahran Alloush, Commander of the Army of Islam on October 14, 2013 in which groups and members of the Syrian revolutionary process stated their rejection « of any attempt by any party to impose authoritarianism upon decision-making and upon the work of citizens. We also reject any attempt to make compliance with any institution not elected by the people, no matter how powerful or wealthy the institution, a benchmark for the public good or a gauge of patriotism or an indicator of the ability to perform civic duty today ». This statement was issued after Mr. Zahran Alloush (Commander of the Army of Islam) pronounced the establishment of the expanded Douma Civilian Council « divisive » because it ought to have taken the Consultative Council that is associated with him as its sole reference point. In the eyes of the people, ISIS is yet another face of the Assad regime because of its authoritarianism, as expressed on a banner in a demonstration on December 27 2013 in Maraat al-Numan in Idlib that said, “The majority of us have become wanted by two states (the Assad regime and ISIS)”. On January 3, 2014, demonstrations occurred in different locations where ISIS was present to demand its departure and overthrow. Chants such as, “Assad and ISIS are one” or ”ISIS get out”, widely used for a while now in liberated areas of Syria, were heard everywhere. 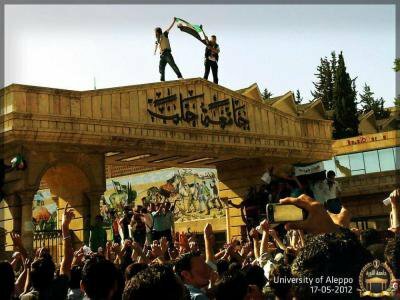 The Syrian revolutionary masses have proven for a while that their revolution is not dead and never has been. But the world does not want to see this symbol. They ignore the fact that, in a neighbourhood of Aleppo as late as Saturday, January 4, 2014, slogans are still being used used against the Assad regime and against the jihadists - slogans such as, “our revolution is against all oppressors ” or "the Syrian people will never submit".